Folded leaflets remain an effective way of promoting your business. Although it may seem like everything is going online, leaflet marketing should still be part of your marketing strategy. It is hard to beat the feeling of holding a high quality and well-designed leaflet. The tangibility of leaflets is what makes them so effective at grabbing the recipient’s attention. Getting creative with your leaflet design is a sure-fire way of standing out from the competition. You need to stick in the minds of your audience. Folded leaflets can help your business grab the attention of your customers. They can help you be more memorable. Creating a folded leaflet design gives you three key areas to use to engage your audience. They can be used to intrigue your audience to engage with your leaflet to find out more about your business. Let’s take a look at the three key areas of folded leaflets and how they can be used to achieve greatest impact. Creating a folding leaflet design rather than a single sheet design will give your leaflet a front cover. It will instantly make it feel and look different from typical leaflets. 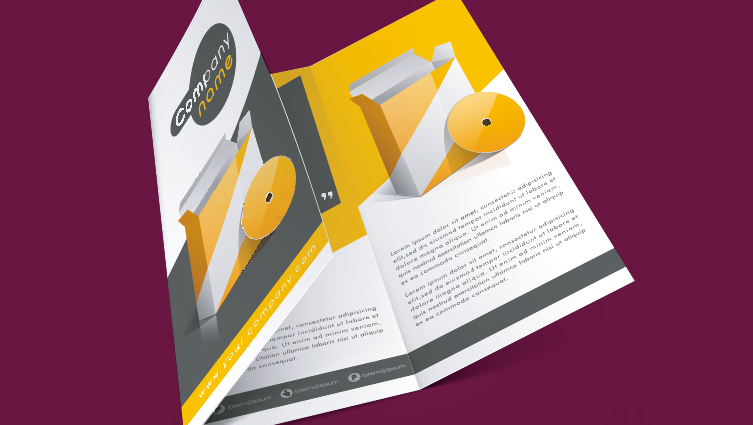 Your folded leaflet front cover can be used to entice your audience to want to find out more. You can include an intriguing message or address a pain point your audience will likely be experiencing. Use your front cover to make a bold statement. Offer a key benefit or start to tell a story to entice your audience to want to unfold your leaflet to find out more. Make sure your folded leaflet front cover stands out. You can include eye-catching imagery or typography that is relevant and on brand. The inside pages of your folded leaflet should be used for your key messages and lead to your call to action. Once you have enticed your audience to open your leaflet you need to deliver powerful messages. You need to entice them to take the next step and act upon your call to action. The inside pages of your leaflet could be made up of one single page, or split into three smaller pages or more. The options are endless. Whichever design you use it is important that you guide your audience to take your call to action. You need to convey your key messages and the benefits they will receive as a customer. The back cover of your folded leaflet design is generally where you would display your call to action and contact details. Think about how you could use this space creatively. For example, it could be used to tie in your digital marketing. You could use a QR code to take your audience to the contact page on your website. It could encourage them to find you on Facebook or other social media channels. It is important to mention that some recipients may turn to your back cover before they read the inside pages. It could be helpful to include other information such as special offers or promotional events. Blackberry are a creative design agency. We work with businesses in Redditch, Worcester, Birmingham, the Midlands and nationally. We help our clients build strong brands that can create loyalty and add value. Blackberry have 25 years’ experience of print. We know print inside out and have the experience to recommend the right solution. If you’d like to discuss folded leaflet marketing, get in touch with Blackberry Design on 01527 517309 or email us via our contact form.